Quantum provides an unparalleled setting for your next corporate event, whether for a high-profile function or an extended overnight voyage for up to eight guests. With its sleek profile, state-of-the-art technology and the option of custom designed signage, this stunning 120- foot super yacht makes an unforgettable impression. You and your guests will indulge in the finest foods and wines accompanied by million dollar views. Host a sit down lunch for 8 guests, a formal dinner for up to 18, a casual buffet for up to 30 or cocktails and canapés for up to 45 guests. Four luxurious staterooms are custom-designed for the comfort of up to 8 overnight guests. With a king bed and desk in the master suite, a queen bed in the V.I.P. suite, double beds in the two guest rooms and Makore timber and cream leather panelling throughout, these cabins offer five-star luxury and privacy. Guests can wirelessly control lights, music, blinds and flat screen TVs using on-board iPads. Quantum’s spacious saloon opens out to an impressive teak and stainless steel aft deck featuring outdoor seating for 12, a large sunbed, lounge area and flat screen TV. From here guests can take in the sights, soak up the sunshine or take a dip in the water from the hydraulic swimming platform. No matter your length of stay aboard Quantum, our team is dedicated to providing the ultimate experience for your guests. A personal on-board chef prepares your cuisine, bringing you mouth-watering dishes created with the finest local produce while you enjoy the sights. We can tailor any aspect of your voyage to suit your requests, from music choices and catering selections to fresh flowers on board for your arrival to ensure your voyage will be truly spectacular. 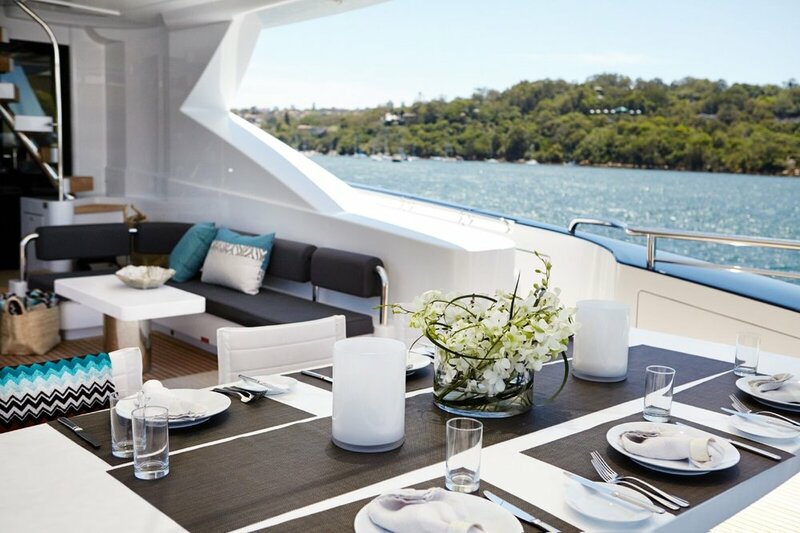 Contact the team today to secure your overnight charter on board Quantum, Whitsunday’s premium luxury superyacht.